Most of the T cells in peripheral lymphoid organs have differentiated in the thymus. Their precursors that enter the thymus from the bone marrow are CD44+, Thy-1+, and c-kitlow (1). These cells generate the CD4−CD8− (DN)3 thymocytes, which can be divided into four phenotypically distinct subpopulations based on the expression of the CD25 and CD44 markers (2). Some of the CD44+CD25− DN thymocytes are precursors of NK, B, and dendritic cells (3, 4). In this population there are also mature NK or γδ T cells that carry TCR αβ or γδ heterodimers and CD3 complexes composed of the invariant CD3-chains γ, δ, ε, and ζ (5, 6). These mature cells may also express disulfide-linked homodimers of the FcεRIγ protein or FcεRIγ/CD3ζ heterodimers in their TCR/CD3 complexes, because this has been observed in peripheral NK and γδ T cells (7, 8). Fetal CD44+CD25− thymocytes also express the FcγRII/III (CD32/CD16) molecules on the cell surface (9). At the stage when the CD25 protein starts to be expressed (CD44+CD25+), the expression of the pTα-chain gene is also initiated (10). Provided the TCRβ-chain locus is successfully rearranged, the pTα protein is brought to the cell surface together with the TCRβ-chain protein and the CD3 complex (11). This pre-TCR complex transmits a TCR β-selection signal via the CD3 complex proteins and as a consequence the thymocyte proceeds to proliferation and maturation (reviewed in Refs. 12, 13). 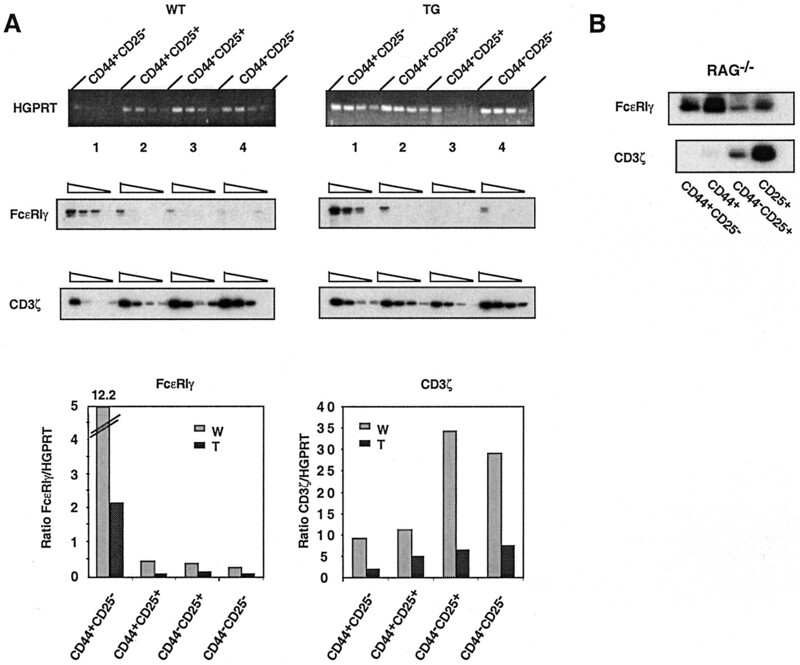 Subsequently, rearrangements of the TCRα-chain gene and expression of the CD4 and CD8 genes (14, 15) are induced, leading to the formation of CD4+CD8+ TCRαβlow cells, which ultimately give rise to mature CD4+ or CD8+ αβ T cells. The developmental pathway of γδ T cells is still poorly understood. The TCRγ- and TCRδ-chain genes are probably rearranged simultaneously with or even slightly before the TCRβ-chain genes (16, 17, 18). Currently, there are conflicting views as to when and how the γδ T cell lineage deviates from the differentiation pathway of conventional αβ T cells; one reason for this is that there are currently no reliable markers defining γδ T cell precursors. It is believed that αβ and γδ T cells share a common precursor cell, because mature cells of both subsets generally have rearranged the genes for both kinds of TCR (reviewed in Ref. 19). Genetically altered mice have been particularly useful as tools to study the molecular events involved in αβ/γδ T cell lineage commitment (reviewed in Refs. 19, 20, 21). Such studies also showed that expression of TCR transgenes or TCR gene inactivation did not always lead to complete ablation of a particular T cell lineage. Thus, in the absence of the particular TCR, cells belonging to the αβ (22, 23) or γδ (24, 25, 26) lineages still developed by the aid of the γδ and αβ TCRs, respectively. Although the simplest interpretation of these data would be that the precursors maturing under these conditions are precommitted to a lineage, the role of the TCR signaling in T cell lineage commitment is still controversial (reviewed in Refs. 19, 20, 21). We have previously studied the expanded population of DN αβ TCR+ T cells in TCRα-chain-transgenic (TG) mice (26). These cells are phenotypically and functionally more similar to γδ T cells than to αβ T cells (27). A small subpopulation of γδ T cells possessing functional TCRβ rearrangements is found in normal mice (28). This population is drastically diminished in the transgenics; therefore, we suggested that the TG DN αβ T cells might arise from precursors of these cells as the result of competition in surface TCR expression during development (26). This may not be the only source of these cells, as they are numerically many more than the TCRβ+ γδ T cells in normal mice. Because it is possible that the surface marker phenotype and function of these DN αβ+ T cells is determined by their precursor origin, we thought that further studies on the development of these cells might be informative for understanding the mechanisms of lineage commitment. To identify the precursors of these DN αβ T cells we have in this report studied TCR expression by thymus precursor populations in TCRα-TG mice. Our data show that early TCRα expression promotes the generation of DN αβ T cells at several early stages of thymocyte development. These TCRα-chain induced cells acquire the DN cell phenotype, and some of them express unconventional CD3 complexes containing the FcεRIγ protein. Our present data further support the view that the phenotype and function of γδ lineage cells are imposed on the precursor cell already at the commitment event (29). C57BL/6 mice and 2B4 TCRα-chain-TG mice (30) inbred on the C57BL/6 background, were kept in a specific pathogen-free animal facility at Lund University. RAG1-deficient mice, provided by William Agace (Lund University, Lund, Sweden) were originally bought from The Jackson Laboratory (Bar Harbor, ME). The thymus, lymph nodes, or spleen were dissected, and single-cell suspensions were prepared in HBSS (Life Technologies, Paisley, U.K.) and washed twice in the same buffer. After centrifugation, thymocytes were resuspended at 40 × 106 cells/ml in HBSS containing anti-CD4 (RL172.4) and anti-CD8 (3.155) Abs. Low-tox Rabbit complement (Cedarlane Laboratories, Hornby, Ontario, Canada) and DNase (10 μg/ml; Sigma, St. Louis, MO) were added, and the suspension was incubated at 37°C for 45 min. Dead cells were removed by density centrifugation (Lympholyte; Cedarlane Laboratories). The remaining lymphocytes were washed in RPMI 1640 medium supplemented with 100 μg/ml penicillin, 100 μg/ml streptomycin, 0.05 mM 2-ME, 1 mM sodium pyruvate, and 10% FCS (cell culture medium; all obtained from Life Technologies). The cells were then resuspended in cell culture medium containing appropriate amounts of either anti-CD4 (GK1.5) and anti-CD8 (53.6.72) Abs, or biotinylated anti-CD4 (RM4-5; PharMingen, San Diego, CA) and anti-CD8β (53.5.81) Abs. After incubation at 8°C for 15 min the cells were washed in PBS supplemented with 2% FCS and magnetic beads conjugated with anti-rat-κ Abs or streptavidin (Miltenyi Biotec, Bergisch Gladbach, Germany) were added. The cells were incubated at 8°C for 20 min, washed, and loaded on a MACS column (Miltenyi Biotec). DN cells were isolated according to the guidelines of the manufacturer and resuspended in appropriate medium for later experiments. Immature single positive thymocytes were prepared by depleting thymocytes of CD4+ cells by magnetic cell sorting. 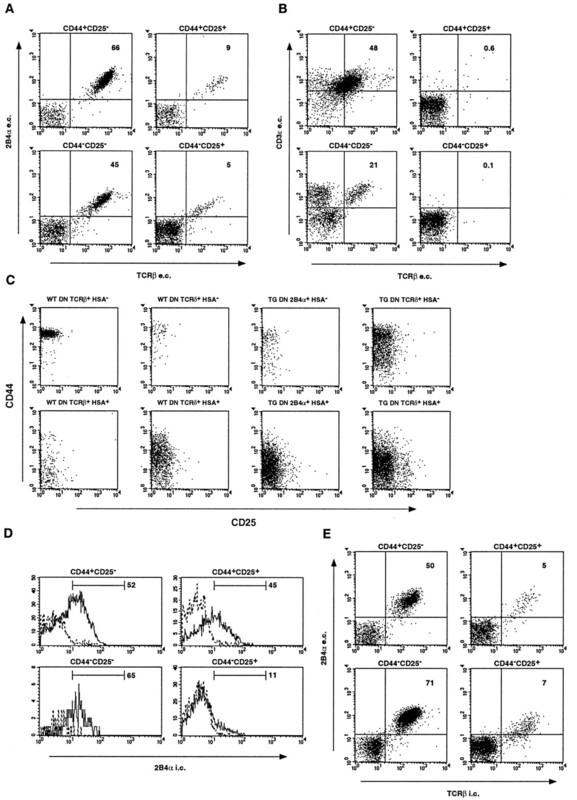 CD8+ CD4− TCRβ− TCRδ− CD44− cells were thereafter isolated using flow cytometric cell sorting (see below). For flow cytometric analyses, cells were resuspended in HEPES-buffered HBSS containing 0.1% NaN3 and 2% FCS. The following Abs were used: PE-conjugated anti-TCRβ (H57), anti-TCRδ (GL3), anti-c-kit, FITC-conjugated anti-CD25 (7D4), anti-TCRβ (H57), anti-TCRδ (GL3), and biotin-conjugated anti-CD44 (IM7) (all obtained from PharMingen). PE-conjugated goat F(ab′)2-anti-rat IgG and FITC-conjugated goat F(ab′)2-anti-rat IgG were bought from Caltag (Burlingame, CA). FITC-conjugated anti-FcRII/III Abs (2.4G2) were purified and conjugated in our laboratory. Cy5-conjugated anti-2B4α (A-24B-2) and CD3ε (KT3) were prepared in our laboratory by using a Cy5 labeling kit (Amersham Pharmacia Biotech, Uppsala, Sweden). PerCP-conjugated streptavidin (BD Biosciences, Mountain View, CA) or Red613-conjugated streptavidin (Life Technologies) were used as second-step reagents. Anti-FcRII/III Abs (2.4G2) were used to block binding to Fc-receptors except those in Fig. 4⇓. Normal rat serum was used for blocking remaining binding sites of anti-rat Ig Abs when appropriate. Intracellular staining was performed essentially as previously described (27). The analyses were performed using FACSort or FACSCalibur flow cytometers (BD Biosciences). For cell sorting, cells were resuspended in PBS supplemented with 2% FCS. Sorting was performed using a FACSVantage cell sorter (BD Biosciences). The purity of sorted cells was >98%. The BW α−β− and WEHI 3 cell lines as well as DN αβ T cell hybridomas previously described (26) were cultured in cell culture medium at 37°C in humidified atmosphere conditioned with 5% CO2. Total cellular RNA was prepared from 105-106 cells using Trizol (Life Technologies) according to the manufacturer’s recommendations. cDNA was prepared using oligo(dT) primer (Promega, Madison, WI) and Superscript II reverse transcriptase (Life Technologies). RT-PCR analysis was performed using a MJ Technologies PTC-100 thermal cycler (MJ Research, Watertown, MA). To standardize cDNA preparations, aliquots were amplified using hypoxanthine-guanine phosphoribosyltransferase (HGPRT)-specific (5′-CACAGGACTAGAACACCTGC-3′, 5′-GCTGGTGAAAAGGACCTCT3′) primers and amplification cycles of 94°C for 30 s, 55°C for 30 s, and 72°C for 1 min for 35 cycles. CD3ζ (5′-AGAAGCCTACACTGAGATCG-3′, 5′-GGATGACGTTCTGTGTTCAG-3′) and FcεRIγ (5′-CACTTCTAATTCTCTCCGAGCC-3′, 5′-CATTGTTTAGTGAGAGTCGAGG-3′) primers were used to amplify the corresponding cDNAs using cycles of 94°C for 30 s, 60°C for 30 s, and 72°C for 1 min for 35 cycles. PCR products were separated on 1.5% agarose gels. The intensity of ethidium bromide-stained bands was quantitated using the Gelpro software (Media Cybernetics, Silver Spring, MD). The CD3ζ and FcεRIγ products were transferred to a nitrocellulose membrane by vacuum blotting in 0.4 M NaOH, 0.6 M NaCl solution. The membrane was cross-linked by UV light and blocked for 1 h at 40°C in 6× SSC phosphate/EDTA buffer supplemented with Denhardt’s solution and 100 μg/ml carrier DNA. Oligonucleotide probes (CD3ζ 5′-TGCTGATGTCACTTGTGAAG-3′; FcεRIγ 5′-GCTAGCTAGGCT-CTACATCA-3′) hybridizing to sequences amplified by the PCR primers were labeled with [γ-32P] ATP (Amersham Pharmacia Biotech) using T4 kinase (Life Technologies). After ethanol precipitation, the probe was added to the prehybridization mixture, and the blots were hybridized overnight at 40°C. The membrane was then washed in 5× standard saline citrate phosphate/EDTA at room temperature for 10 min and exposed to x-ray film for 1–12 h.
C57BL/6 and 2B4 TG fetuses were taken from timed pregnant females at day 14 of gestation. Thymi were dissected and placed on Nucleopore Track-Etch membranes (Corning Separations Division, NY) in RPMI 1640 medium supplemented with 10% FCS (Sigma), 100 μg/ml penicillin, 100 μg/ml streptomycin, 0.05 mM 2-ME, 1 mM sodium pyruvate, and 2% MEM nonessential amino acids (Life Technologies). The 2B4 TG thymic lobes were cultured for various days at 37°C at 5% CO2. The C57BL/6 thymic lobes were first irradiated (3000 rad) in a cesium source and transferred to Terasaki plates (Nunclon; Nunc, Roskilde, Denmark). The lobes were then seeded with CD3−CD4−CD8− (triple negative, TN) CD44+CD25+ or CD44−CD25+ thymocytes sorted from the 2B4 TG mice by adding 1–4 × 104 sorted cells in 20 μl medium per well and lobe. The plates were then inverted for 2 days (hanging drop cultures). On day 2 the lobes were transferred to Nucleopore Track-Etch membranes and incubated as above until analysis by flow cytometry. Enriched DN thymocytes and peripheral cells from TCRα TG mice were incubated with biotinylated A-2B4-2 TG TCRα-chain-specific Ab in precapping solution (PBS, 1% BSA) at 4°C. The cells were washed and streptavidin-PE (PharMingen) was added. The cells were then either incubated on ice or at 37°C for 10–30 min to induce capping. After this the capping was inhibited by adding 1.5 ml ice-cold capping solution (PBS, 1% BSA, 0.1% NaN3). The cells were then fixed in 2% paraformaldehyde, and intracellular staining of the FcεRIγ protein was performed. The method of intracellular staining was as previously described (27), with the exception that the cells were blocked intracellularly with normal rabbit serum before adding anti-FcεRIγ serum (Upstate Biotechnology, Lake Placid, NY) and FITC-conjugated goat anti-rabbit-Ig (PharMingen). The cells were loaded on to Polysine microslides (Menzel-Gläser, Freiburg, Germany) and fixed in Fluorescent Mounting Media (Dako, Carpinteria, CA) overnight before they were analyzed using a confocal microscope (MRC 1024; Bio-Rad, Hercules, CA) equipped with filters set for FITC and Texas Red. The images were analyzed using Lasersharp software (Bio-Rad). Lysates from the TG DN αβ T cell hybridomas expressing FcεRIγ mRNA were subjected to immunocoprecipitations of CD3ε- or TG TCRα-associated proteins. Cells (100–200 × 106) were lysed for 1 h in Nonidet P-40 buffer (1% Nonidet P-40, 150 mM NaCl, 50 mM Tris, pH 7.5, and 1 mM PMSF) at 4°C. The lysates were centrifuged at 13,000 rpm at 4°C for 15 min, and the supernatants were mixed overnight at 4°C with anti-CD3ε (145.2C11) or A-2B42-conjugated Sepharose beads (a gift from M. Gullberg, Umeå University, Umeå, Sweden). The beads were then washed twice in 1 ml 0.1% Nonidet P-40 solution, twice in 1 ml 150 mM NaCl, 50 mM Tris (pH 7.5), and twice in 1 ml 50 mM Tris (pH 7.5). The samples were then boiled in 30 μl of 3× Tricine-SDS loading buffer (4% SDS, 12% glycerol, 50 mM Tris, 10% 2-ME, 50 mM DTT, 0.01% Serva Blue G, pH 6.8) for 10 min and loaded on a 10% Tricine-SDS-PAGE gel (31). The separated proteins were transferred to membranes (Hybond-C Extra; Amersham Pharmacia Biotech) using a Trans-Blot SD SemiDry Transfer Cell (Bio-Rad). The membranes were blocked for 45 min in PBS with 5% dry milk and 1% Antifoam (Sigma). Abs to the FcεRIγ (Upstate Biotechnology) and CD3ζ-chain (PharMingen) proteins were added in 50 mM Tris (pH 7.5), 150 mM NaCl, 2.5 mM EDTA, 15% FCS, and 0.02% NaN3 for 1–2 h and the membranes were then washed three times for 15 min each in PBS with 0.1% Tween 20. Proteins were revealed using the ECL system (Amersham Pharmacia Biotech). The Kaleidoscope Prestained Standard protein marker (Bio-Rad) was used to estimate the molecular mass of revealed proteins. A TG DN αβ T cell clone that was negative for FcεRIγ mRNA was used as a specificity control. The conditions for detecting FcεRIγ protein were optimized using lysates of the WEHI-3 macrophage cell line precipitated with the 2.4G2 mAb. Previous results have suggested that the expanded population of DN αβ T cells in TCRα-chain-TG mice originate from γδ lineage precursors (26). As a first step to identify the immediate precursors of these cells we analyzed expression of the TG TCR in the four DN thymocyte precursor populations defined by CD44 and CD25 expression (2). As shown in Fig. 1⇓A, a fraction of the cells in all these populations expressed the TG TCRα-chain-positive αβ TCR. Most importantly, DN TCRαβ+ cells were detected in the TG CD44+CD25+ and CD44−CD25+ DN populations, whereas very few TCRαβ+ cells were detected in these populations in normal thymocytes (Fig. 1⇓B). The latter result was expected because these populations do not express the TCRα-locus (32). It has previously been reported that the CD44+CD25− precursors have not yet rearranged their TCRβ genes (33, 34). However, subdivision of the DNαβ and DNγδ T cells using the CD24 (heat-stable Ag, HSA) marker provided a possible explanation to the presence of TCRαβ+ cells in the CD44+CD25− population. As shown in Fig. 1⇑C, both in normal and TG mice the majority of the CD24+ cells of both αβ and γδ lineages were CD25− and expressed low or intermediate levels of CD44. The majority of the CD24−, presumably more mature DNαβ and DNγδ T-cells in normal thymus, expressed higher levels of CD44 and a fraction of the cells expressed the NK.1.1 and CD122 markers (data not shown). The TG CD24− DNαβ cells expressed slightly lower levels of CD44 than those in normal thymus, and, as previously shown (26), the TG cells were NK1.1− and CD122−. These data indicated that the TCRαβ+ cells in the CD44+CD25− population might be derived from CD25− that had up-regulated their CD44 expression after TCRαβ expression. This possibility was also suggested by previous data (35). To better understand the role of the various TCR proteins in the development of the TG DN αβ T cells, we next tested whether the TG TCRα-chain protein would be expressed also in TCR− cells. To this end DN TG thymocytes were stained intracellularly with Abs toward the TCRα protein and surface TCRβ/TCRδ-negative cells analyzed. The TG TCRα protein was expressed intracellularly by variable proportions, but not by all cells, of the four TN populations (Fig. 1⇑D). We consistently observed low 2B4α-chain expression in the CD44−CD25+ population, but the reason for this phenomenon is not known. In similar experiments we also observed that virtually all the thymocytes in these populations expressing intracellular TCRβ-chains also expressed the αβ TCR on the membrane, as revealed by surface TG TCRα staining (Fig. 1⇑E). These data indicated that TCRβ expression is a limiting factor for the development of the TG DN αβ T cells. In an attempt to identify when the TG DN αβ T cells appear during intrathymic development, we purified TN CD44+CD25+ and CD44−CD25+ precursors from TCRα TG mice by cell sorting and studied their differentiation potential in FTOCs. At day 3 of culture, we found TG DN αβ T cells of the CD44+CD25+ phenotype in lobes seeded with CD44+CD25+ precursors (Fig. 2⇓A). In addition, TG DN αβ T cells were found in the subsequent developmental stages during the following 2 days of culture. This indicates that the seeded CD44+CD25+ precursors differentiated in the FTOCs such that they both expressed the αβ TCR and by time acquired the CD44/CD25 phenotype of later developmental stages. We have not formally addressed in reconstitution experiments, however, the possibility that cells that have already expressed the αβ TCR may change their CD44/CD25 phenotype and hence be allocated to a certain downstream population. Nevertheless, because CD44−CD25+ precursors gave rise to TG DN αβ T cells (data not shown), we conclude that these cells can develop at several stages. As expected (2), both of these populations also gave rise to the development of γδ T cells (data not shown). As an independent approach to study the kinetics of appearance of TG DN αβ T cells in the various DN populations, we cultured day 14 fetal TCRα TG thymic lobes in vitro. The proportion of TG TCRα+ cells in the CD44+CD25+ and CD44−CD25+ populations decreased by time in culture (Fig. 2⇑B), as did the overall number of cells in these populations (data not shown). In contrast, the proportion of TG TCRα+ cells in the CD44−CD25− population increased as did also the overall proportion of this population. These data provided further support for the conclusion that TG DN αβ T cells develop at several stages of differentiation. It has previously been shown that the FcεRIγ gene is expressed in the early fetal thymus, whereas the CD3ζ gene is expressed later during gestation and in the adult thymus (36). Studies of FcεRIγ gene expression during T cell development in the adult thymus have shown that this gene is expressed primarily in CD25− DN thymocytes (37), whereas the CD3ζ gene is expressed mostly in the CD25+ DN population and in later stages of development. Furthermore, fetal thymocytes express the Fc-receptors for IgG of both the FcγRII and FcγRIII isoforms (9). In our experiments, we also detected FcγRII/III-positive cells in the CD44+CD25− population of adult TG thymocytes both by RT-PCR analyses and flow cytometry using the 2.4G2 Ab (data not shown). Taken together, these previous observations suggested that DN precursor T cells may express the FcεRIγ gene. To clarify this issue, we isolated the four TN populations defined by CD44 and CD25 expression from adult thymocytes of C57BL/6 and TCRα-TG mice by cell sorting and compared their expression of the FcεRIγ and CD3ζ genes using RT-PCR. In accordance with previous data (37, 38), we found that the steady-state level of CD3ζ mRNA was relatively low in the CD44+CD25− population but increased during development (Fig. 3⇓A). Conversely, the steady-state level of FcεRIγ mRNA was relatively high in this population, whereas the level decreased in the following TN populations. The TCRα transgene did not influence the expression pattern of these two genes as the data obtained from normal and TG thymocytes were essentially identical. To confirm that the FcεRIγ gene is expressed in bona fide precursors we also analyzed various thymocyte populations from RAG 1-deficient mice. As can be seen in Fig. 3⇓B, the FcεRIγ and CD3ζ genes were also reciprocally expressed in CD44+ and CD25+ precursors in this case. Taken together, these data suggested that the FcεRIγ gene may be expressed in the subpopulations that give rise to both γδ and TG DN αβ T cells. In addition, they suggested that early maturing T cells might use the FcεRIγ protein instead of the CD3ζ protein in their TCR/CD3 complexes. We observed that a fraction of peripheral TG DN αβ and γδ T cells expressed the FcγRII/III marker by flow cytometry (Fig. 4⇓A). These data appear contradictory to previously published results (7, 39). The reason for this discrepancy is not known, but might be related to the low expression level of these molecules. However, we have also confirmed the expression of the FcγRII/III molecules in both these cell types by RT-PCR analyses (data not shown). In those experiments we also investigated whether the membrane FcγRII/III expression by peripheral DN T cells would correlate with FcεRIγ mRNA expression. As shown in Fig. 4⇓B, this gene was expressed in TG DN αβ T cells, γδ T cells, and NK T cells. We also analyzed FcεRIγ expression in 10 randomly picked clones of TG DNαβ T cell hybridomas. In accordance with the above flow cytometry analyses, 2 of 10 clones (20%) were FcγRII/III+ by flow cytometry and expressed the FcεRIγ gene by RT-PCR analysis (data not shown). Because some TG DN αβ T cells may develop from early precursors, expressing the FcεRIγ gene (Figs. 2⇑ and 3⇑), we wanted to know whether the FcεRIγ expression at the mRNA level would correlate with the use of the FcεRIγ-chain in TCR/CD3 complexes of these cells. To investigate this possibility, we analyzed the same hybridomas by immunoprecipitation experiments. Anti-CD3ε Abs coprecipitated both the FcεRIγ (10 kDa) and the CD3ζ protein (14 kDa) from lysates of the two clones that were positive for FcεRIγ-mRNA (Fig. 4⇑C). Abs to the TG TCRα-chain coprecipitated the CD3ζ protein but, for unknown reasons, did not efficiently precipitate the FcεRIγ protein. As would be expected, the FcεRIγ protein was not detected in an anti-CD3ε Ab precipitate from a lysate of a FcεRIγ mRNA-negative clone (Fig. 4⇑D). The fact that the anti-FcγRII/III Ab precipitated a protein of approximately the same size from lysates of the macrophage cell line WEHI-3 (Fig. 4⇑E) further confirmed the identity of the FcεRIγ protein. This experiment also excluded the possibility that the precipitation of the FcεRIγ protein by anti-CD3 Abs would be due to binding of these Abs to Fc-receptors. Taken together, these data demonstrated that some of the TG DN αβ T cells express the FcεRIγ protein in TCR/CD3 complexes. We also wanted to confirm that the FcεRIγ protein would be expressed as a part of TCR/CD3 complexes of DN TCRαβ+ thymocytes from the TCRα-TG mice. To test this possibility, the TCR/CD3 complexes of TG DN thymocytes were stained with biotin-labeled anti-TG TCRα Abs and PE-streptavidin. Thereafter the cells were fixed and stained intracellularly to detect the intracytoplasmic part of the FcεRIγ protein. 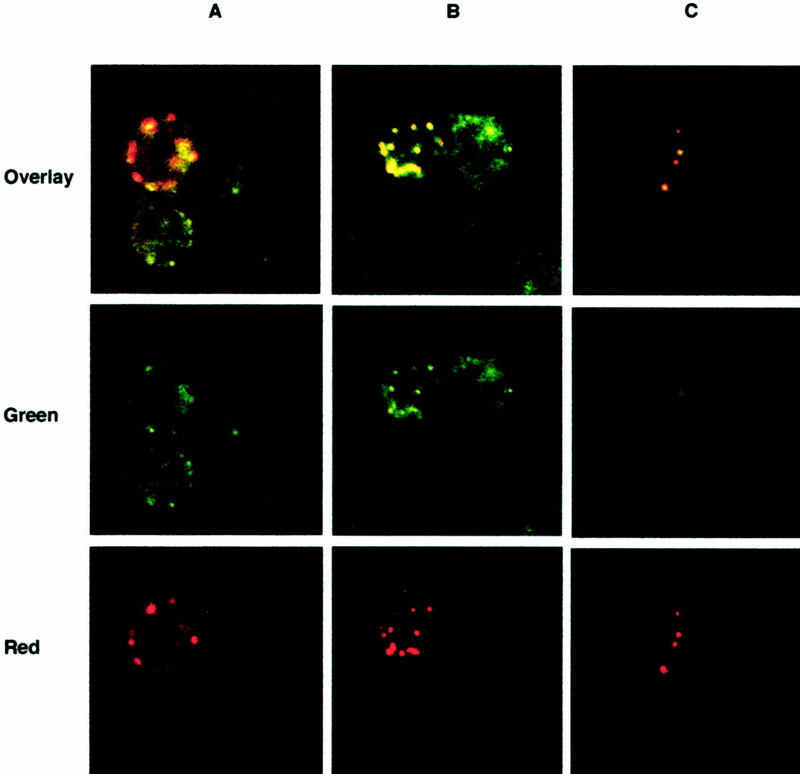 The thymocytes showed a somewhat patchy distribution of both the TCRα proteins (red) and the FcεRIγ proteins (green) (Fig. 5⇓A). This pattern of TCR staining is very similar to that observed when precursor thymocytes were stained with pTα Abs (40). The fluorescence of the TCRα and FcεRIγ staining overlapped on some cells, suggesting that these proteins partially colocalized in the membrane (top cell in Fig. 5⇓A, middle and lower panels). However, areas with FcεRIγ staining alone were also seen on such cells, suggesting that they may also express Fc-receptors. The reason why overlapping these two images did not always yield the expected yellow color (Fig. 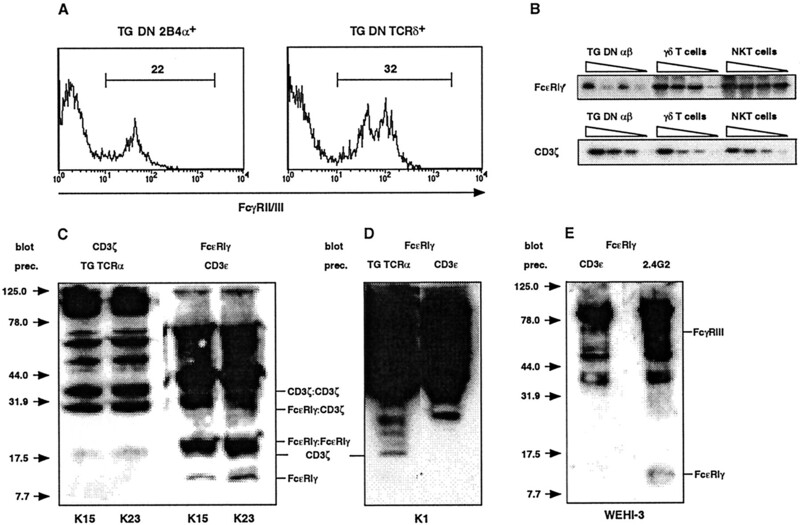 5⇓A, top panel) could be due to the relatively low intensity of the FcεRIγ staining and that not all TCR/CD3 complexes contained the FcεRIγ protein. We reasoned that if the FcεRIγ protein would indeed be associated with the TCR then one would also expect these proteins to colocalize after capping the TCR with specific Abs. Capping of the surface TCRs was induced by incubating the cells at 37° during the staining with PE-streptavidin. The incubation was interrupted at various times, and a sample where a large number of the cells had visible cap formation by fluorescence microscopy was further analyzed. The capping greatly increased the overlap of the TCRα- and FcεRIγ-specific staining (Fig. 5⇑B, top left cell), further supporting that these molecules colocalized in the membrane. Note that this cell still had areas with FcεRIγ staining only indicating that it also carried Fc-receptors. As a specificity control, capped cells were stained with irrelevant rabbit Abs and the FITC-conjugated second step Abs (Fig. 5⇑C). In this sample we detected only red fluorescence from the bound anti-TCR Abs and no green fluorescence. We also detected thymocytes that expressed αβ TCRs that were not detectably associated with the FcεRIγ protein, as well as thymocytes that stained for the FcεRIγ protein only (see Fig. 5⇑B; cell to the right). The latter were numerous and probably represented TCR− cells and γδ T cells. The above results indicate that a fraction but not all of the DN TCRαβ+ thymocytes expressed TCR/CD3 complexes containing the FcεRIγ protein. These data taken together with the observation that the FcεRIγ and CD3ζ genes are expressed in a reciprocal fashion in early precursor thymocytes are consistent with the view that early developing TG DN αβ T cells may express these unconventional TCR/CD3 complexes. The TCRα-chain gene is expressed later than the other TCR genes; therefore, the TCRα-chain protein is an important limiting factor in αβ T cell development. In this report we present data indicating that expression of the TCRα-chain protein by transgenesis induced expression of the αβ TCR at developmental stages at which very few TCRαβ+ cells could be detected in the normal thymus. Thus, in the TCRα TG mice we found TCRαβ expressing cells already in the CD44+CD25+ and CD44−CD25+ DN thymocyte subpopulations. The development of such cells was also detected both by analysis of fetal TG thymi at various days of development and in normal fetal thymi reconstituted with adult TG TN CD44+CD25+ and TN CD44−CD25+ precursors. Other investigators have previously reported that these precursor populations from normal mice are also capable of reconstituting the development of γδ T cells (2), and we have confirmed these data using TG precursors (K.P., unpublished observations). The TG TCRα-chain protein could potentially interfere with the development of both αβ- and γδ lineage cells. As shown in our previous report, the proportion and absolute number of double positive (DP) thymocytes is decreased in TCRα-TG mice (26). The pre-TCR is important both for the progression of αβ T cell development and for the expansion of αβ-lineage cells (reviewed in Ref. 41). The decrease in DP thymocytes observed in the transgenics might then be due to the fact that TG TCRα-chain proteins compete with pTα proteins in binding to the TCRβ-chains, thereby leading to suboptimal formation of the pre-TCR in the precursor cells. Furthermore, our previous report (26) also demonstrated that TCRβ-expressing γδ T cells were depleted in the TCRα-transgenics, suggesting that the TCRα-chain expression interfered with γδ T cell development as well. In this report we showed that the CD3ζ and FcεRIγ genes were expressed in a reciprocal manner in adult TN thymocytes both in normal and in TG mice. The expression of the FcεRIγ gene was high during the early CD44+CD25− stage after which it declined, whereas expression of the CD3ζ gene was low in that population and increased thereafter. Most importantly, the expression of the TCRα transgene induced the maturation of early precursors to DN TCRαβ+ T cells expressing the FcεRIγ protein as a component of the TCR/CD3 complex. Thus, our data suggest that the usage of this protein in the TCR/CD3 complex of mature peripheral T cells might be developmentally controlled and fixed upon expression of the TCR heterodimer. If this possibility would be correct one would expect that γδ T cells maturing at later stages of development might use the CD3ζ rather than the FcεRIγ protein. Indeed, many peripheral γδ T cells do not express the FcεRIγ gene nor do the majority of TG DN αβ T cells (data not shown). However, this hypothesis could not be directly tested in the FTOC experiments because the yield of mature γδ T cells is so low that the association of the FcεRIγ protein with the TCR/CD3 complex in these cells cannot be firmly established. The settlement of this point will have to await more elaborate experiments in which γδ T cell are recovered from the FTOCs, expanded, and analyzed with either of the two approaches used here. The CD3ζ, CD3η, and FcεRIγ proteins all have in common that they participate in the assembly of the TCR (42, 43). FcεRIγ-deficient mice appear normal in T cell development, even though the peripheral and thymic DN TCR+ cells have a TCRlow phenotype in these mice (44). The functional performance of TCRs carried by γδ T cells of FcεRIγ-deficient mice was not reported (44). However, another study demonstrated that γδ T cells from TCRγδ-TG CD3ζ-deficient mice responded to TCR stimulation but not to Ag-specific stimulation (45), indicating that the FcεRIγ protein at least in some situations cannot functionally fully replace the CD3ζ protein. Indeed, the association of the tyrosine kinase fyn and the downstream signaling from FcεRIγ-containing TCR/CD3 complexes was shown to be distinct from those containing CD3ζ (46). Thus, T cells carrying the unconventional TCR/CD3 complexes might be functionally different from those carrying conventional CD3ζ-containing complexes. Interestingly, not only mature conventional αβ T cells but also NK T cells were depleted in CD3ζ-deficient mice (47). The deficiency in NK T cells might either be due to the lack of CD3ζ signaling or to the few DP thymocytes in these mice, because the DP cells are crucial for the development of NK T cells (48, 49, 50). In contrast, γδ NK T cell numbers were increased in these mice. We favor the view that γδ and αβ NK T cells are both able to develop in the absence of CD3ζ expression, but that γδ NK T cells are independent of DP thymocytes for their maturation. Our previous report suggested that some of the TG DN αβ T cells derive from γδ T cell precursors that had successfully rearranged the TCRβ-chain (26). However, due to the large number of the TG DN αβ T cells, this may not be the only source of these cells. NK1.1+ DN αβ T cells are also depleted in the thymus but not in the liver of these mice (Ref. 26 and data not shown). Therefore, some of the TG DN αβ T cells might originate from precursors of NK T cells. Such cells may not express an autoreactive TCR due to the “forced” expression of the TG TCRα-chain, and would then not acquire the characteristic NK T cell phenotype (8). The observation that TG DN αβ T cells developed at several TN stages and that most of these cells probably originate from precursors of γδ T cells (24, 26), suggests the possibility that γδ T cells in the normal thymus will also mature at these stages provided they express the γδ TCR. As shown in here (Fig. 1⇑B), very few surface CD3-positive TCRβ-negative cells were found in the normal thymus at the CD44+CD25+ and CD44−CD25+ stages. Importantly, however, we detected a low but significant number of γδ T cells in these populations in in vitro cultured fetal thymi (data not shown). Thus, the use of transgenesis revealed the capacity of γδ lineage cells to develop at these stages of differentiation. Furthermore, our present data suggested that γδ lineage cells developing in the thymus may express the FcεRIγ protein as a component of their TCR/CD3 complexes. Because we have previously shown that the TG DN αβ T cells studied here also up-regulated CD8αα-expression upon activation (27) exactly as γδ T cells, these data taken together indicate that γδ T cells phenotypically similar to those found in gut epithelium (37) can also be produced in the thymus. The pre-TCR plays an important role in the allelic exclusion of the TCRβ locus (51, 52). Furthermore, it was claimed that the pre-TCR delivers a signal directing the γδ vs αβ lineage split toward the development of αβ lineage cells, as more γδ T cells expressing intracellular TCRβ-chains were generated in pTα-deficient mice than in normal mice (53). These data were interpreted to suggest that the pre-TCR would remove precursors from the γδ lineage. However, virtually all CD25+ TN precursors have been shown to express the pTα protein (53, 54) and, if the above explanation were correct, one would not expect to find in normal mice γδ lineage cells expressing the TCRβ protein intracellularly. Alternatively, lineage commitment might be induced before TCR expression and the role of the pre-TCR would be to confirm that decision. It is clear that in the absence of a functional pre-TCR, αβ lineage cells still develop. Thus, both the αβ-TCR and the γδ-TCR can compensate for the role of the pre-TCR in development, even though the production of DP thymocytes is much less efficient (23, 25) in these cases. Furthermore, our present and previous results as well as those from another group indicated that γδ lineage precursors could be induced to maturation by the αβ TCR (24, 26). These data are clearly compatible with the alternative possibility and suggest that the role of the TCR in these cases would be rather to induce survival/maturation signals in already committed precursors. The apparent inefficiency of pre-TCR-deficient mice in generating DP thymocytes, i.e., αβ lineage cells, is probably a result of the relatively poor capacity of the γδ and αβ TCRs in inducing the expansion of early precursors. The reason why more αβ than γδ lineage cells develop in the adult thymus as compared with the fetal thymus could rather be due to the efficient expansion of αβ lineage cells induced by the developmental stage-specific expression of the pre-TCR than to a direct role in αβ lineage commitment. Thus, the role of the TCR signaling in lineage commitment is still controversial and will require more experimentation to be settled. While this manuscript was under revision, Terrence et al. (55) provided further evidence for the γδ lineage origin of the transgene-induced DN αβ T cells studied here. Furthermore, Trop et al. (56) demonstrated that TCRα-chains efficiently displace the pTα protein and thereby prevent pre-TCR expression, as proposed in this manuscript. We thank Dr. Martin Gullberg for his expert technical advice and generous gift of reagents, Stefan Seth for operating the confocal microscope, Dr. Su Ling Li for helpful advice, Dr. Susanna Cardell and Dr. William Agace for gift of RAG1-deficient mice and for improving the manuscript, and Prof. Tomas Leanderson for support. 1 This work was supported by grants to F.I. from the following foundations: Anna Greta Crafoords Stiftelse för reumatologisk forskning, Greta och Johan Kocks Stiftelser, Konung Gustaf den V:s 80 års fond, Kungliga Fysiografiska Sällskapet i Lund, the Alfred Österlunds stiftelse, and the Medical Faculty of Lund University. 3 Abbreviations used in this paper: DN, CD4−CD8−; FTOC, fetal thymus organ culture; TN (triple negative), CD3−CD4−CD8−; HGPRT, hypoxanthine-guanine phosphoribosyltransferase; DP, double positive; TG, transgenic; HSA, heat-stable Ag. Aifantis, I., J. Buer, H. von Boehmer, and O. Azogui. 1997. Essential role of the pre-TCR in allelic exclusion of the TCR β locus. [Published erratum appears in 1997 Immunity 7:following 895.] Immunity 7:601.